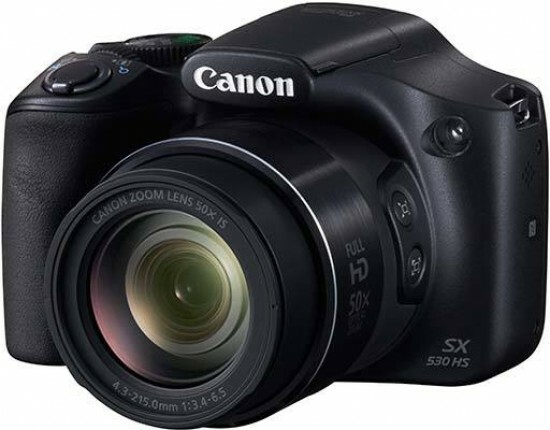 The Canon PowerShot SX530 HS is the latest high-zoom bridge camera from Canon. It replaces the previous SX520 model and features a 50x optical zoom, which is joined by a 100x digital ZoomPlus. Other features of the SX530 include a 16 megapixel sensor, inbuilt Wi-Fi and NFC and the ability to take full manual control. There are digital filters, and you can shoot full HD movies. The Canon PowerShot SX530 HS competes quite closely with the Panasonic Lumix DMC-FZ72 (60x optical zoom) and the Nikon Coolpix P610 (also 60x). 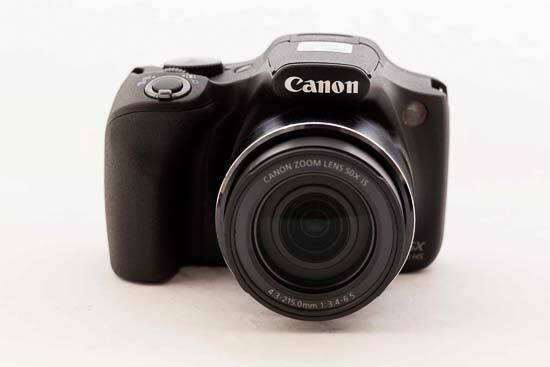 The Canon PowerShot SX530 HS digital camera has an official retail price of £259.99 / €299.99 / $379.99. 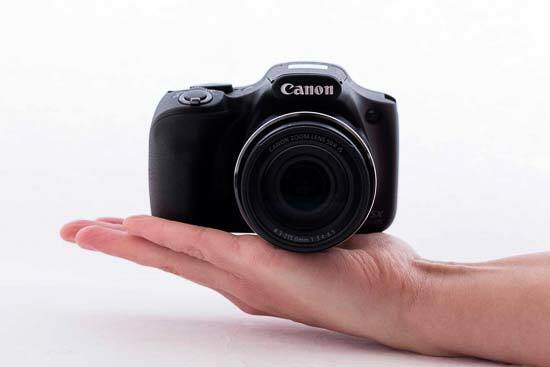 Although not the biggest bridge camera on the market, the Canon PowerShot SX530 HS is still reasonably sizeable - you're not going to be able to fit into a coat or jacket pocket. You're also likely going to want use both hands when shooting with it - your left to steady the lens, especially when shooting at the far reach of the telephoto optic. The Canon PowerShot SX530 HS's grip has a textured coating which has a double effect of both giving it a higher quality feel and helping it to feel secure in the hand. The grip is recessed so your middle finger sits comfortably on the grip, while your forefinger rests naturally on the shutter release. Just behind the shutter release button is a scrolling dial which is used for different functions, depending on the shooting mode you're in. In aperture priority, it controls aperture, while in shutter priority it controls shutter speed. If you're shooting in full manual, you can switch between altering shutter speed and aperture by pressing the exposure compensation button. The dial itself is very easily reached by your forefinger and has just the right amount of resistance to it. The shutter button meanwhile needs to be pressed in quite firmly to take the shot. This can sometimes have an impact on very precise framing, as pressing the button down so firmly can cause the camera to shift just a fraction. It can also cause a little shake, which can be problematic when using slow shutter speeds, it's recommended therefore that you use the self-timer if you're shooting something like that to give the camera time to steady again before exposing the shot. There's a reasonably large mode dial, which gives you quick access to all of the different exposure modes which the Canon PowerShot SX530 HS offers. There's manual and semi-automatic modes (P/A/S/M), along with automatic, Hybrid Auto, scene modes, Creative Shot and digital effects. There's also LIVE, which displays the effect making a change to certain settings makes. It's designed to help you get the shot you want without necessarily knowing the photographic terminology to achieve it. Hybrid Automatic mode is a fun option for special occasions, such as a wedding or a party. The Canon PowerShot SX530 HS will take a short video just before the shutter button is pressed, giving you a movie at the end of the day which contains all your still photos along with the two second clips combined into one video. A new video is created each day, but there's no way to edit which photos / video make it into the final video for the day. You can't use this option if you're shooting on one of the other modes, either. Moving to the back of the camera, there's a traditional four way navigational pad, with each of the directional keys having an assigned function. Up controls ISO, left controls focusing type (manual, general, macro), down changes the way the display looks, while right accesses flash controls. Although there is a button for flash controls, you still need to raise the flash yourself manually when you want to use it. If you press the central button on the navipad, a sort of quick menu will appear. You'll be presented with different options depending on which shooting mode you're shooting in. If you're in one of the advanced (semi-automatic / manual) modes, you'll have more options than when shooting in automatic or scene mode. It's a handy way to access different options, such as white balance, aspect ratio, image size and so on without having to go into a long winded main menu. You'll have to press the central button again to get rid of the menu altogether. Although it will disappear if you half press the shutter release, it'll still be there when you let go. 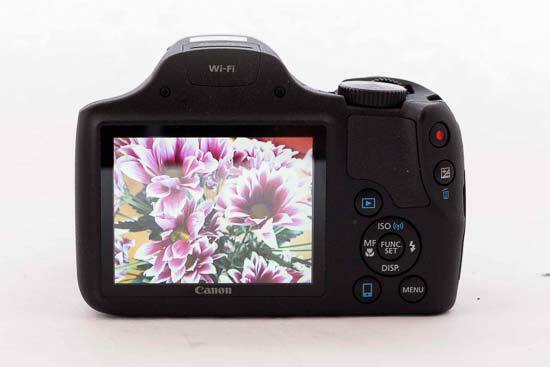 There are three more buttons on the back of the Canon PowerShot SX530 HS - a playback button, a main menu button and another button for quickly accessing the Wi-Fi settings. If you press this latter button, the information you'll need to connect to the camera from a smart device will be displayed. Once you've connected, you need Canon's Camera Connect app where you can download images you've taken or control the camera remotely. Unfortunately, I was unable to get the app to recognise that the camera was connected to my smartphone - I suspect that the app hasn't been updated for the new camera. However, I've used Canon Camera Connect before and it's performed well in the past so hopefully this just requires a quick update from the company. The main menu, accessed via its own button, is divided into two sections, one for altering picture settings, such as IS Settings and Date Stamp. Most of the settings you'll likely be changing often, such as white balance etc, are contained within the quick menu mentioned earlier. The other tab on the main menu is for altering non picture related settings, such as the date and time, the volume of the camera and so on. On the back of the Canon PowerShot SX530 HS is a thumb rest, and on the side of this you'll find two more buttons. There's a direct video record button for quickly recording movies, and the exposure compensation button. When you've pressed this latter button, you can use the scrolling dial on the top of the camera to add in some positive or negative exposure compensation. Around the shutter release button is the zoom switch. It's quite a fluid motion and takes you from the fully wide position to the full optical zoom satisfyingly quickly, pausing for just a split second before entering the digital zoom realm - useful if you want to keep an eye on only using optical zoom. Although there's no zoom switch on the lens barrel as you find with some other cameras like this, there are a couple of useful buttons. The first is the Zoom Framing Assist button. If you're shooting a subject at the far reach of the zoom and it goes out of frame (such as a bird, for instance), you can hold this button down and the lens will quickly zoom back out until you've relocated the subject. Once you've found it, release the button and the zoom will return to its previous position. It's much quicker than doing it using the zoom switch and is very handy for wildlife and moving subjects. Just underneath this button is another which you can use for locking onto a moving subject - again useful for wildlife and sports photography. There's no viewfinder on the Canon PowerShot SX530 HS, if you think you're likely to want one of those, have a look at the higher specced Canon PowerShot SX60 HS. The screen meanwhile although fairly low resolution by some standards, at 461,000 dots, copes well in most situations except for very bright sunlight. It's also a fixed screen so not quite so useful for awkward angles, selfies and so on. On the base of the Canon PowerShot SX530 HS you'll find a screw for attaching a tripod, as well as the door which conceals the camera's battery and memory card. It's a touch annoying that you can't access the memory card when the camera is attached to a tripod, but it's only a minor complaint. 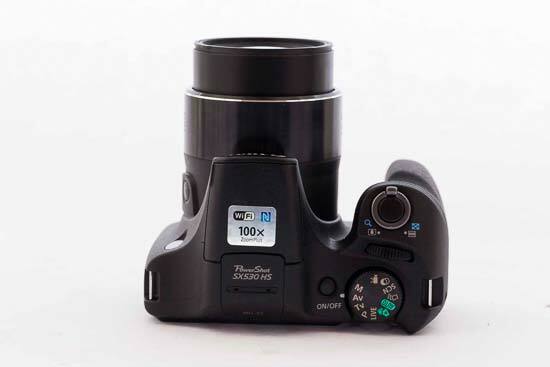 Autofocus is generally swift and accurate, locking onto the subject with ease. It's a shame that you can't change the autofocus point though - especially given that you can manually control all of the other settings on the camera. Macro focusing is pretty impressive, you can almost be touching the subject with the lens and it will still focus - particularly useful for frame filling flower shots and so on.